Longboarding isn't reserved for the boys anymore. The adrenaline rush has soared high among young girls as well. However, it is important to consider a few things while picking the longboards for girls – the riders' style, preference and body. Here, are the best longboards for beginners girls that are highly recommended and appreciated all across the world. 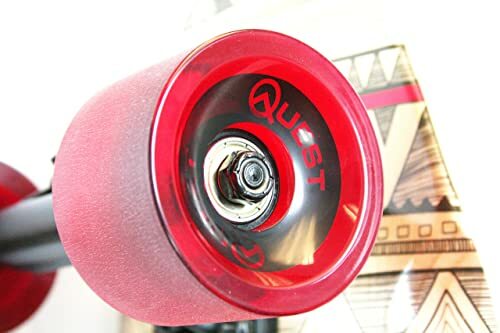 Why should you consider Quest Native Spirit Kick Tail Longboard? Why should you consider Penny Fade Complete Skateboard? Why should you consider Punked Lowrider Drop Down Through Longboard? For those who are about to step into the world of longboarding, Quest Native Spirit Kick Tail Longboard Skateboard is an ideal board. It is a reasonably priced board with hardy multi-ply maple deck and other perks. 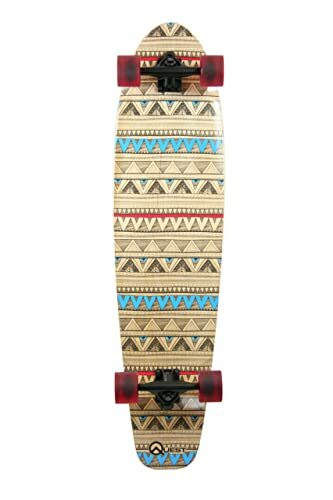 With Aztec inspired design, it is definitely an amazing board that everyone admires. 40-inch deck made of 7-ply hardwood maple. 70mm sturdy PU wheels with 80A hardness level. ABEC7 bearings with 4mm hollow risers. Kick-tail longboard for easy tricks and turns. Perfect size and built – The 40-inch long deck is made of seven layers of maple wood - perfect for cruising. It is strong and lasts longer. It got great maneuverability, making the swift turns at high speeds. The Aztec inspired design makes it more appealing. Kicktail – The kicktail back end helps rider to perform the tricks, turns, curbs and pop ups with more ease. Smooth cruising – The clever shape of the quest longboard facilitates great cruising with smooth turning. The large deck stabilizes and makes the rider comfortable. With premium bearing, reverse kingpin, it is a reliable and safe ride. Durable wheels and rugged trucks – The 80A 70mm polyurethane wheels possess a good grip protecting the rider from falling off the board. The hard-wearing wheels perform really well on all terrain at a fast pace. The rugged 6-inch aluminum trucks give the rider ability to make the turns with better responsive control. It showcases ABEC7 bearings with 4mm hollow risers adding to its stability.. Recommendation – With many recommendations, it has whipped 4.5 stars for itself on Amazon. Amazing! Facilitates smooth, responsive riding at a high speed. Sturdy deck with a kicktail. Good for anyone above 12 years, especially beginner girls. Recommends to change the bearings. 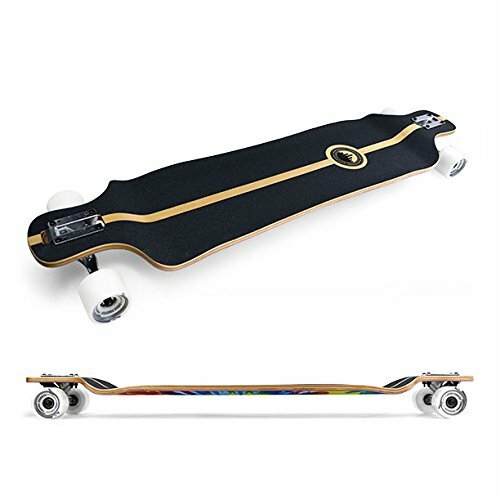 On a whole, this Quest longboard is a highly recommended best longboard for girl. If you are planning to use longboard as a mean of transport, give it a thought. 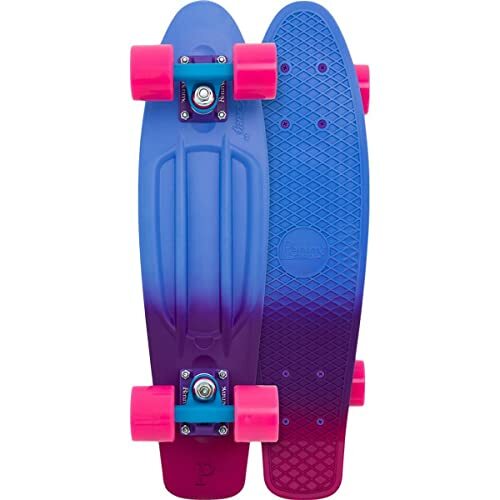 This Penny board is most desired skateboards for girls available in the market. With a 22-inch deck, and curved middle it offers better control on any surface. A unique ride with impressing features for all the passionate ladies! 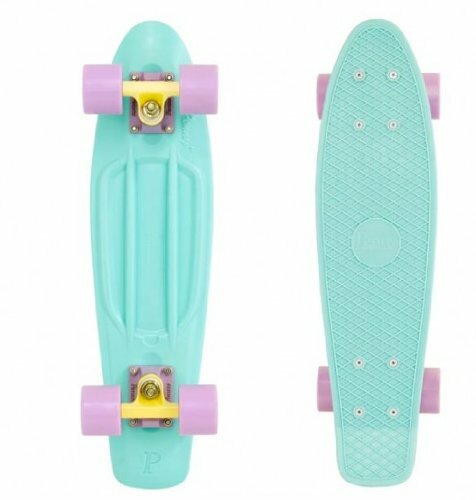 22-inch deck comes in vicious candy shades that every girl loves. 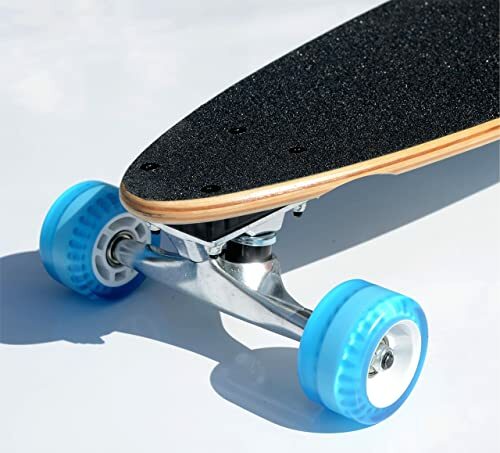 3.125-inch Penny skateboard trucks with 356 cast aluminum powder-coat. 59mm Penny wheels with 83A hardness level. Designed for students, girls, skatelovers. Stylish to look at - The peppy design and bright candy shades make it most loved skateboards for girls. Overall, it got a vintage look with some outstanding color combinations. Easy-to-carry – Penny Fade Complete Skateboard is lightweight and handy. Carry it anywhere you like to. It is just 22-inch in size – so small and so effortless to ride. Solid construction –The solid construction of the skateboards lets you skate over all terrain irrespective of your weight and height. It can support up to 250 pounds. Durability - Each and every part of the part of the board is made up of premium quality material, making it extremely durable. Performance – The 22-inch extended deck along with a kicktail makes it notable. It ensures you best performance on different terrain. Performance satisfaction – guaranteed! Better control and stability – The 59mm 83A Penny wheels and 3.125-inch Penny trucks together ensure better control at high speed. The grippe soft wheels absorb in all the cracks, giving you a smooth and stable ride always. Grease the bearings and trucks for an even better performance. Fastest skateboard – It is so fast that you can literally race on it. It is good with high speed, however it may not be equally efficient in performing tricks; particularly for tyros. Recommendation – Penny Fade Complete Skateboard has earned 4.6 stars on Amazon with 81% of the customers giving it full 5 stars only. Sturdy construction with attractive look. Lightweight, but supports up to 250 pounds. Grippe large wheels with strong trucks – smooth to ride. Ideal for commuting, even long distance rides. Available in vibrant color combinations. Apt for commuting and all skating styles. Some recommends to change the bearings. Not ideal for performing tricks. Penny Fade Complete Skateboard is a marvelous board. Perhaps, that is why it is one of the leading skateboards for girls in the market. Atom Pintail Longboard is a classic board with wide wheel base, providing you stability and balance for some excellent high-speed cruising moments. It is renowned for its quality, comfort and economical pricing. 39-inch long, 9.4-inch wide and 6-inch wide and weigh only 7.3 pounds. The classic pintail shaped drop through deck avoids wheel bite. Easy-to-control, ideal for cruising – perfect for girls. Made of Maple laminate with fully roofed with 80 grit aluminum oxide grip tape on top. Comes with 8.5-inch aluminum trucks, 90A-HR suspension, 22mm ABEC5 bearings, 65mm 78A urethane wheels, .375-inch chromos kingpins. 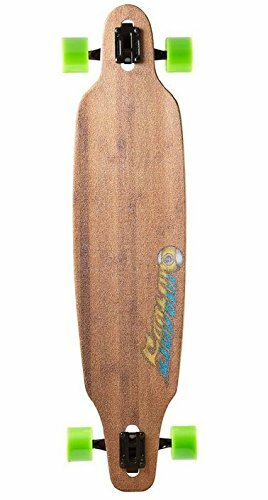 Ideal for carving –This classic pintail longboard is what you need for carving as it prevents wheel bites. It makes those sharp turns smoothly without any wheel locks. The flexible maple laminate deck holds you well, which reduces strain on your feet and knees. 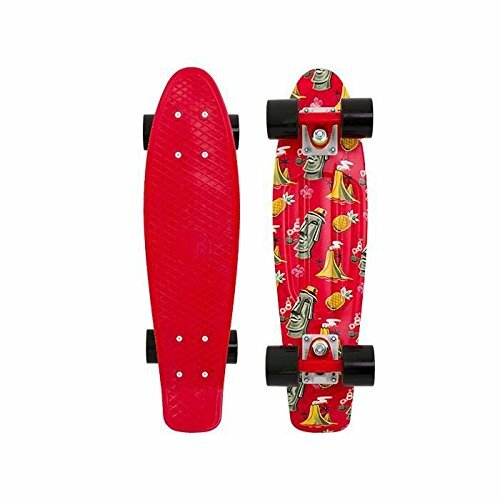 Reliable bearings – Atom Pintail Longboard comes with very reliable ABEC5 bearings that helps you learn new tricks and riding styles smoothly at once. Nice wheels – The wide 65mm 78A urethane wheels provide you the required balance for cruising at higher speeds. You get the best and smoothest cruising experience like none other. Appropriate for all riders– The classic pintail longboard is perfect for both beginners and advanced riders. It got stability and maneuverability for the evolving longboards while offering great speed to the skilled ones. Even transitional riders can enjoy the downhill longboarding with absolute safety. It is a rare, but perfect combination. 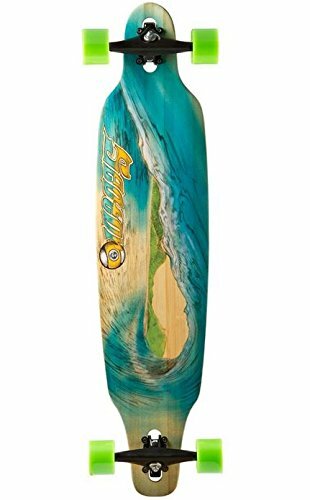 Recommendation – This Atom longboard is swarming with positive feedbacks on Amazon. Averaging all the feedbacks, it got 4.5 stars. Compact structure with great graphic at an affordable price. The board got excellent grip –suitable for speedy cruising. Soft wheels absorb all the cracks and bumps of the road. May need to change the bearings. It is exposed to grueling actions. 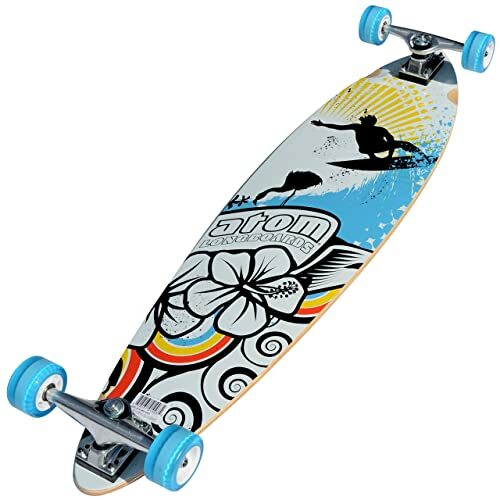 Presently, Atom Pintail Longboard is one of the best longboards for beginners girls. Appropriate for cruising, downhill and swift cruising. Get ready to add some enthralling moments to your life! This Yocaher Longboard combines both of the drop down and drop through deck styles nicely.. It is versatile and ideal for downhill longboarding. Comes in 29 different designs and styles to choose from. With a low center of gravity, it is perfect! Measures 40.75-inch in length and 9.5-inch in width. Made of 9-ply of hard Maple wood. Appropriate for downhill riding and freestyle riding. Comes with 180mm hanger, and 9.675-inch HD7 trucks along with reverse king pin. 78A 70x52mm Q-ball PU wheels. ABEC7 Chrome bearings with 8mm risers. Appropriate for riders of all age groups. Look – The underside of the deck comes with some amazing colorful designs. There are 29 different designs to suits customers' varying choice. Sturdy construction – The 40.75-inch board is made of 9-ply of maple wood and 9.675 –inch aluminum trucks, sturdy 78A PU wheels, and quality chrome bearings giving strength to the board. Being made of maple wood along with quality parts, it is meant to last longer. Heavy-duty trucks and wheels – The 70x52mm Q-ball wheels got good grip providing you soft and stable rides, The soft wheels, heavy duty trucks, 180mm hanger and reverse kingpin together offer reliable and smooth freestyle and downhill riding. It adds maximum smoothness and responsiveness while taking the quick sharp turns while absorbing the pressure. Bearings – The durable ABEC7 chrome bearings add life to the longboard while maintaining stability at high speed downhill riding. Grip tape – The entire top of the longboard is covered with 80A black grip tape protecting it from unwanted scratches and getting wet. It holds the riders' foot precisely in position. Flex – Due to full maple construction, it has low flexibility. However, well-structured trucks, wheels and bearing add a fair amount of flexibility. Recommendation – Won countless heart as the best longboard for beginner girls. Achieved 4.4 stars with more than 60% buyers appreciating and giving it 5-stars. 40.75-inch double drop design maple deck. 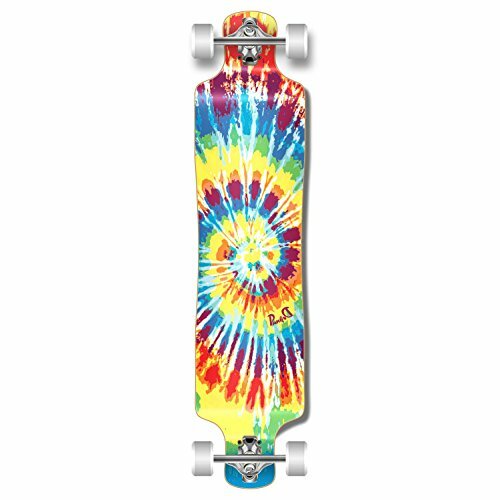 Attractive longboard with colorful painting – 29 different designs. 8mm plastic risers prevent wheel bite. Solid Q-ball wheels are soft – providing stable rides. Good control at high speed. Available at a good price. The painting and grip tape can come off early. This Yocaher longboard is one of the best longboards for girls, when it comes to safety, performance, speed and style. Experiment new riding style without any fear of mishaps! Designed for anyone who loves riding, Sector 9 Blue Wave Lookout Drop Through Complete Longboard Skateboard is safe and comfortable for all. The wisely priced longboard got some really eye-catching graphics and have everything to be your best buddy outdoors. 42-inch long, 9.6-inch wide with 31.5-inch wheelbase. Sandpaper-like veneer look – totally attractive. Made of 5 ply of bamboo laminated vertically with camber mold. Comes with 10-inch Gullwing Chargers trucks, PDP ABEC5 bearings, 74mm 78A Sector 9 top shelf wheels. Drop through mounting of the board makes it stable for freestyle rides. A3200 Jessup clear grip tape at the top for excellent grip. Stable, easy to control, light weighted – ideal for beginner girls. Style and impression – To be modest, the wave graphic art is really cool! However, there are other attractive graphics if anyone prefers a different style. Tough construction with flex – This Sector 9 Longboard got a tough construction with 5-layers of bamboo laminate. Bamboo makes it firm and slightly flexible at the same time. Maneuvering – Large 74mm wheels with a hardness level of 78A on durometer along with high-quality bearings and trucks, give you great carving and cruising experience. Stability – The board promises intensive cruising and adventure for several months. No matter how roughly you use, it would definitely last for many months. Quality – uncompromised. Comfort – The manufacturer got the wheelbase and deck design right. They definitely know what it takes to get a comfortable and stable ride. Recommendation – Achieved 4.5 stars with 77% of customers giving full marks. Seems like, it does what it claims. Made of 5 layers of bamboo laminate – strong and durable. Comfortable riding even on rough terrain. Good control and excellent grip even at high speed – essential for beginners. Narrow ends, but wider at the middle help in taking sharp turns smoothly. Better quality at an economical price. Recommended to replace the wheels and bearings for better downhill riding. Its flexible, safe and stylish. This Sector 9 Longboard could be a worthy investment. If you want a smooth ride for a beginner, but at a cheaper price. Atom got a versatile longboard, while Quest got an inexpensive one that is best for transportation and cruising. 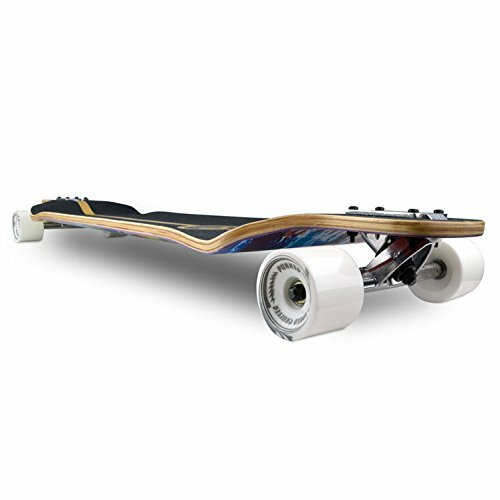 Yocaher Punked Lowrider Drop Down Through Longboard Complete Skateboard is coupled with a distinctive double deck mounting design with amazing looks, yet available at an affordable price. Sector 9 Blue Wave longboard is ideal freestyle ride. Whereas, Penny Fade Complete Skateboard got solid construction in attractive sugary shades along with a kicktail. All of the recommended longboards for girls mentioned has won millions of hearts –for being versatile or inexpensive or fast. But, Penny board has turned up as an all-rounder. Unlike any of its fellow contenders, it has won 5 stars from 81% of its customers averaging 4.6 stars on a whole. Undoubtedly, it got all the potential to top the chart!